Level 6 DOD Crosscut Auto Feed Paper Shredder. Has been evaluated by NSA and meets the requirements of NSA/CSS Specification 02-01 for High Security Crosscut Paper Shredders. The T-12AF Shredder features innovations not found on any other high security shredder. 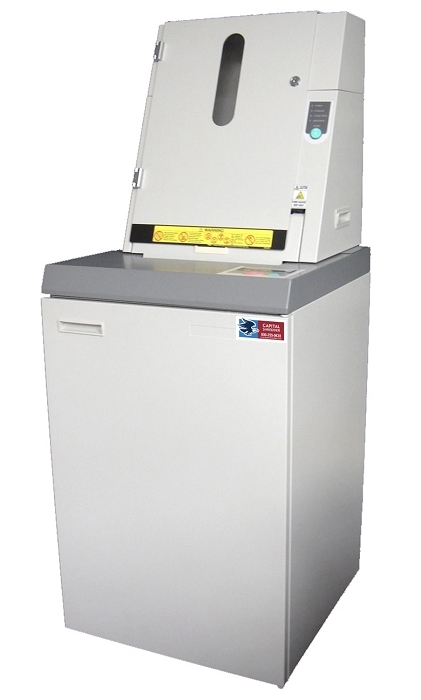 The unique Document Auto Feeder allows HANDS OFF SHREDDING of up to 1000 sheets at a time. Simply load the Auto Feeder tray and walk away! The Feeder door locks for security and the Automatic Start/Stop turns off the shredder when the job is complete. The T-12AF can also be used for standard manual shredding at a NSA tested rate of up to 20 reams per hour! The advanced cutting system requires no oiling and the floating head design consists of individual stacked cutters. This allows for cutting head rebuilding in the event of damage; an option not available on most shredders which use solid block cutting heads. The continuous duty motor is equipped with a super potential power unit for variable speed to maximize motor torque and sheet capacity. A fan press inside the cabinet ensures that all shred is uniformly pressed to increase waste bin capacity and reduce the mess caused by the spillover of shredded paper. The auto reverse anti-jam feature prevents overfeeding and the bag-full and door open switches provide extra safety. Other features include a LCD backlit control display and a low energy standby mode as well as an attractive insulated all steel cabinet on rolling castors for quiet operation.